I’ve known Kam Fatz for a while and I’ve always liked what he’s put out. He’s not all slick and polish, he’ll be the first to admit that, but what he does bring you is high value information and The Drive is no different. Kam Fatz (Jennings) made his money online running a membership site and has always made a big thing of encouraging others to do the same. It’s a great plan, gets people in for a longer haul and gives you more opportunities to offer real value to the people who have found you. It’s very much the ‘Know, Like & Trust’ that I and many others go on about so much. A membership site can increase that a lot and very quickly too. If you have good content, people will see it frequently and know that you are someone who can help them go even further. Kam’s latest offering to the world is called ‘The Drive’, purely because much of it is Kam talking to his camera while he drives around. It makes things very relaxed for both the presenter and the viewer and even if Kam loses his way round what he’s talking about sometimes, it’s no less entertaining for it. And bear in mind that products are as much about entertainment as information. When were you last entertained by a course you bought? Now just because Kam’s delivery is informal doesn’t mean the content is the same. The advice given is spot on and there are assurances that delivering content does not have to be as complicated as it appears. 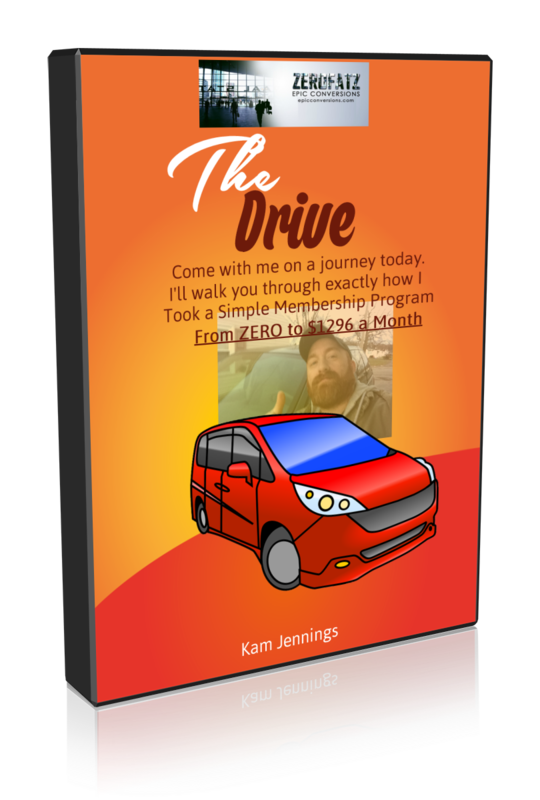 Kam has a very Keep It Simple approach in The Drive and his suggestions for running a membership program could include people with almost no budget at all. At least in the beginning. Any decent membership site will start to bring you regular income and can then easily almost promote itself. So what do you get for your money in The Drive? Three well presented videos – 2 from the drive around and one in his office. Two PDFs – one a write upof the drive and the other, a printout of the mindmap that Kam takes you through and three bonuses of Kam’s older membership site offerings on PDF – The whole system together being something that should encourage you to strike out and build your own membership system in any niche. What’s missing? Not a lot really. The two tonnes of filler and BS that so many others feel necessary to burden their buyers with. Definitely none of that in The Drive. Step by step details on the ‘How’ are not really there, but Kam does tell you short cuts that he has used successfully and because he’s not technical, he does skimp on the technical details. That is far less of a problem than you might think as there’s plenty of help on YouTube and elsewhere to do anything you’re not sure of. And if you think that’s mean of him, you might consider whether you actually have the drive of your own to set up and run a membership program. Do I like The Drive? I think you can tell I do. There’s not any life-changing revelations in it, but there is a lot of solid information and a simpler way of looking at things when you’re considering a membership scheme. Click the link here to and see what you think for yourself.